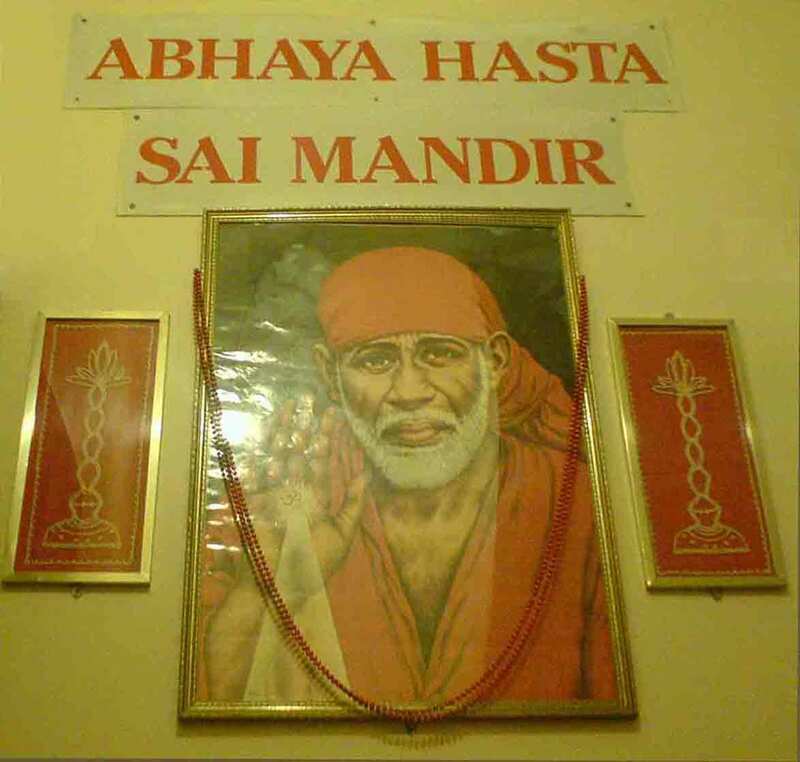 Sai Dham (abode of Sai) is the UK and Europe's first meditation/prayer centre dedicated to Bhagwan Shirdi Sai Baba. 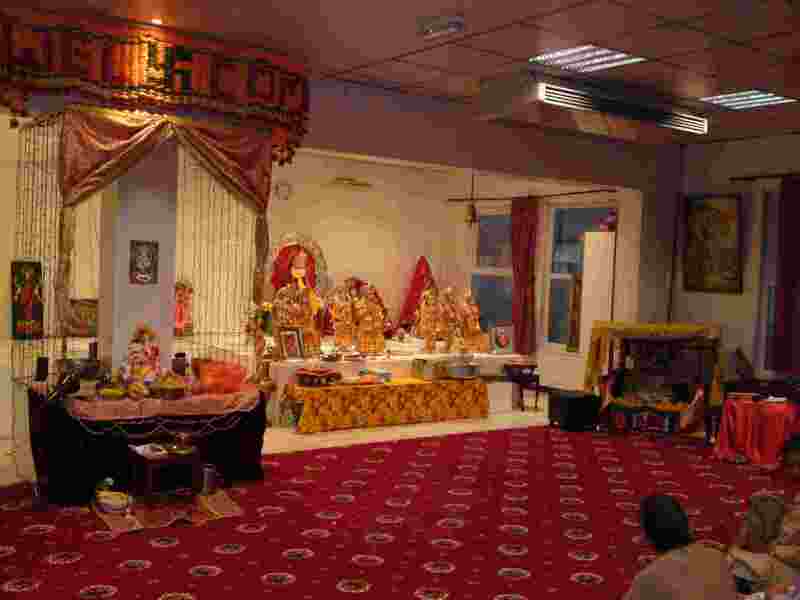 Within the walls of premises situated at Egypt Road, New Basford, Nottingham, UK, are housed a marble statue of Shirdi Sai Baba, photographs of Sathya Sai Baba, statues of Venkateshvara Balaji, Hanumanji, Durga Mata, Ganeshji and a Shiva Linga with Nandi. For more information on Sai Baba and what Sai means click here or for images of these Murthis and the Mandir gallery click here. A city known for the tales of Robin Hood, but why Sri Sai Das Babaji chose Nottingham, of all the places in Europe which could stake a claim to establish the most unique Shirdi Sai Mandir, is a wonderful mystery to us all. Such is the uniqueness of Sai Dham, not only is it the only temple in Europe dedicated to Shirdi Baba, but also Abhishek's are carried out on the Murthis every morning and Bhajans occur every evening at the premises, with dinner served to all on Saturdays. For more information on opening times click here. Today there are 10 Sai Dham’s spread all over the world, but this website is dedicated to the very first Sai Dham which was setup in 1994. Some of the others include Sai Dham's in New Jersey USA, Massachusetts USA, Nairobi in Kenya, Iringa in Tanzania, Jammu and Kashmir in India and head quarters Sai Foundation India located at Prashanti Dham, Ujjain, Madhya Pradesh in India. The following is the story of how this first Sai Dham in Nottingham came about. "The beautiful Sai Centre that will emerge in Nottingham will herald many new works of Bhagavan Baba's. There will also be a small Sathya Sai hospital. For all this, you people will not have to do anything, there will be no need to collect money or anything. In Sai's, work it is faith and not money that is needed. It will all be Sai's and he will look to it all. It is his headache not our headache. We just have to enjoy the fruits of that centre. From the day when a Shirdi Sai Baba idol will be installed in Nottingham in 1994, the Sai Centre will start to function. How is the Centre to be started? From where are the parts going to come? Who is going to run the Centre? How are people going to enjoy the fruits of the Centre? What is the purpose of the Centre? All these questions will be answered through your own experiences right from the time the Shirdi Baba idol is installed." He returned in September 1993. The number of devotees regularly gathering at the home of Mr P. N. Sharma was beginning to get very large indeed, so Babaji suggested that the devotees look for a place where a temple could be set up. Several places were suggested and Babaji chose one in particular. It was an old disused two storey mini supermarket in a built-up residential area of Nottingham. Babaji announced that the name of the centre would be Sai Dham and that it would contain within it a temple called the “Abhaya Hasta Sai Mandir” meaning the Lord's hand raised in blessing, granting shelter and protection for the devotee. He fixed the date for inauguration to be 20th April 1994, Ramnavmi day, declaring that all the idols, pooja materials and other items for the temple would be provided by Baba himself and (the then recently set up) Sai Foundation India. So, the small group of devotees set about "building" a temple. Efforts to buy the property were met with difficulty. A local opposition group who did not want a Sai temple to be opened in Nottingham, pushed the price of the property up by making false offers to purchase it. The result was that the building cost 40% more than it should have. Nevertheless, the keys to the building were received on Thursday 17th February 1994 and the building finally become ours. The building was in a very poor state indeed. The entire place was caked in grime and dirt. New electricity cables and wiring was required, in several places walls had to be knocked down, fans and lighting had to be installed, the pooja hall (which was on the upper storey) had to be planned and decorated, a platform where the idol of Shirdi Baba would reside (with other deities) had to be constructed, benches for devotees to sit on had to be built, carpets had to be laid, wallpapering and plastering had to be done and the entire opening ceremony had to be planned. The list of jobs was endless and barely two months remained to complete the tasks. Luckily, an army of devotees came forward to help. Everyone from small children to senior members of the community came to clean, scrub, hammer, plaster, wire, decorate and offer support in any way that they could. Despite all the hard work, a smile was on every face and people were full of excitement and enthusiasm. Many local people made generous donations, others provided loans for extended periods and many others provided their skills and support. Meanwhile in India, on 14th March 1994, Sai Foundation India members travelled to Whitefield for Bhagawan Sri Sathya Sai Baba’s darshan. They held aloft photographs of the Nottingham idol along with various other items destined for Sai Dham. Swami placed his hands on the objects and blessed them all. Back in England, the clock was ticking. It seemed that there was too much to do and not enough time. Babaji was due to arrive in Nottingham on 15th April with a 22 strong party of devotees from India. The building had to be ready by then. On Friday 8th April the exquisite marble statue of Shirdi Baba arrived. Measuring 4’6” tall, it weighed nearly 180kgs. The days passed quickly until finally, there were only a few days to go. The pooja hall was still not ready, the platform still needed some finishing touches, wood had still not arrived for benches and carpets had not been delivered. In addition, Babaji had requested that one small room be provided to house a bed, chair, table and lamp for Sathya Sai Baba. This room was still to be cleaned and we did not have the funds to buy the furniture for the room. At this point, people began to panic and threw up a prayer for help. Almost instantly, a lorry arrived with the wood for the benches, from the other side, another van arrived with carpets. The problem of Swami’s room was solved in the following wonderful way. Mr. Uttam Bhai, a Sai devotee, arrived from a neighbouring city (Leicester) with his son, Bharat. Even though it was their first visit to the building, they seemed to know exactly where Swami’s room was. 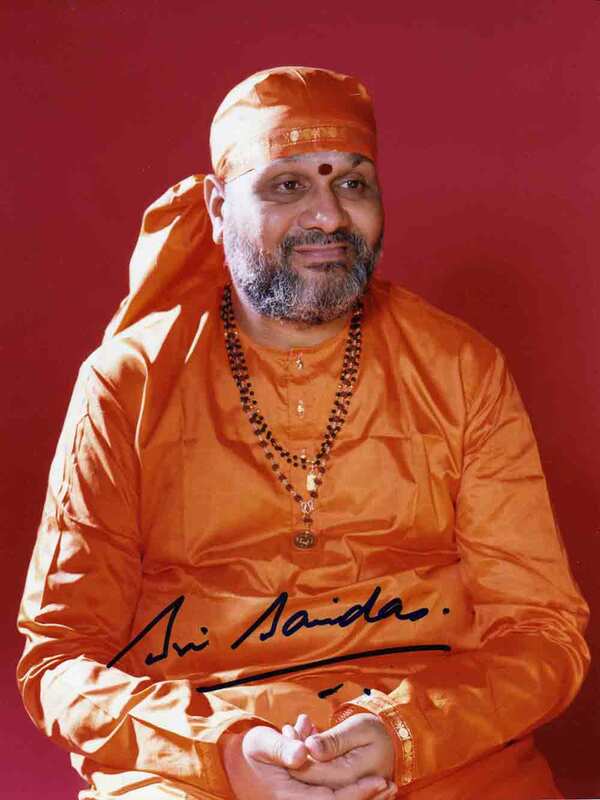 They announced that Bharat has experienced a dream the previous night in which Swami had asked him to go to Sai Dham in Nottingham and to take a bed, bedding, table, chair, lamp and other items and to arrange His room there. We were all wonderstruck to hear this. Bharat had seen the layout of the building in his dream and hence knew exactly where Swami’s room was! Suddenly it seemed that everything was going to be alright and we were surprised at how quickly the gargantuan task was being completed. Sadly, others, who did not share our devotion and wished to see us fail, were also surprised that such a small group of people could get a temple ready in such a short time. We received poison-pen letters threatening to spoil the opening of the temple. Some letters even threatened physical violence against Babaji himself if the opening was not abandoned. April 15th finally came around and still the devotees were busy putting finishing touches to the temple. Babaji and his party arrived in the evening. As Babaji entered the building, a local devotee who had worked day and night on the temple, Mr. Vinubhai Mistry was driving the final screw into a sign on the wall. As Babaji entered Sai Dham for the first time, their eyes met, tears of joy welled into Vinubhai’s eyes. Although, he had heard much about Babaji, this was the first time they had met. Babaji stood in front of Vinubhai and beckoned him forward. Still in his overalls and clutching a screwdriver, Vinubhai became the first person to receive charan sparsh (blessings) inside Sai Dham. On 20th April the idols of Ganesha, Shiva Lingam, Nandi and Shirdi Sai Baba were installed with due formalities and rituals. The idol of Shirdi Baba was so heavy that it took eight men about half an hour to place it on the central position on the platform. Babaji performed the Praan Pratishtaan (life giving) ceremony. A giant photograph of Bhagawan Sri Sathya Sai Baba was installed on the platform along with a giant photograph of the Samadhi in Shirdi. The entire centre was full to busting on that day and just as Babaji has assured us, there was no trouble of any sort. That was how the very first Sai Dham was inaugurated. Since then, Venkateshvara Balaji has been installed, Hanumanji has also landed in Sai Dham, Durga Mata has also arrived and most recently on Sunday 21st October 2007 Lakshmi Narayan, Ram Darbar, Gauri Shankar and Radha Krishna were installed. The complete programme of that Pran Pratishthan Mahotsava (Murthi Installation) is available here. Since its opening on 20th April 1994, Abhisheks have been performed on Ganesha, Shiva Lingam and Shirdi Baba each and every day. Bhajans have also taken place every single day. The centre has organised many festivals and poojas and has made efforts to raise money for worthy causes. A small youth wing has also been setup and a games room with pool table at the Mandir. People from all over the world have visited Sai Dham. Some have found cures for their illness after taking the holy tirth of Baba’s Abhishek water. Many other have found peace after taking the darshan of Shirdi Baba. The jyoti from this first Sai Dham (Nottingham) has been used to light the flame in other Sai Dhams all over the world and the keeper of the flame, Babaji himself, provides love and encouragement to continue the work of spreading the message of love and brotherhood and to keep the akand jyoti burning ever bright. Our Sathguru H.H. Sri Sai Das Babaji shed his mortal coils and took Mahasamadhi on 1st September 2006, the Mahasmadhi programme of our Samarth Sathguru Sri Sai Das Babaji was held at Prashanti Dham, Ujjain on September 4th 2006. Henceforth, 1st September every year is commemorated as Aradhana Day at Sai Dham for Babaji. For more information on H. H. Sri Sai Das Babaji click here.